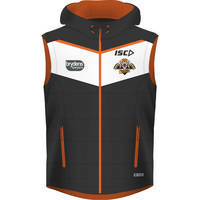 The Wests Tigers padded vest is the perfect game day garment! The quilted vest jacket keeps the torso warm with excellent insulation to weight ratio. It is fully wadded throughout, and the polyurethane coated shell will keep you dry in the harshest of conditions.